I appreciate updates and photos of Show-Me Puppies get! This photo is compliments of Ms. Holli. This is little Ms Me (formally Vanessa). Beautiful!!! Chihuahua Puppies AKC Available Soon! I have posted two of our tiny Chihuahua girls on our Chihuahua page. If you are looking for an exceptional little long-coat Chihuahua that will stay small take a look at Josie and Itsy. They are both gorgeous! Thank you Vicki for the update and photo of Meekia and Jade Christmas 2011. "Kricket laying with her big sister Thumbelina." Kricket is the little white Maltipoo in the photo. 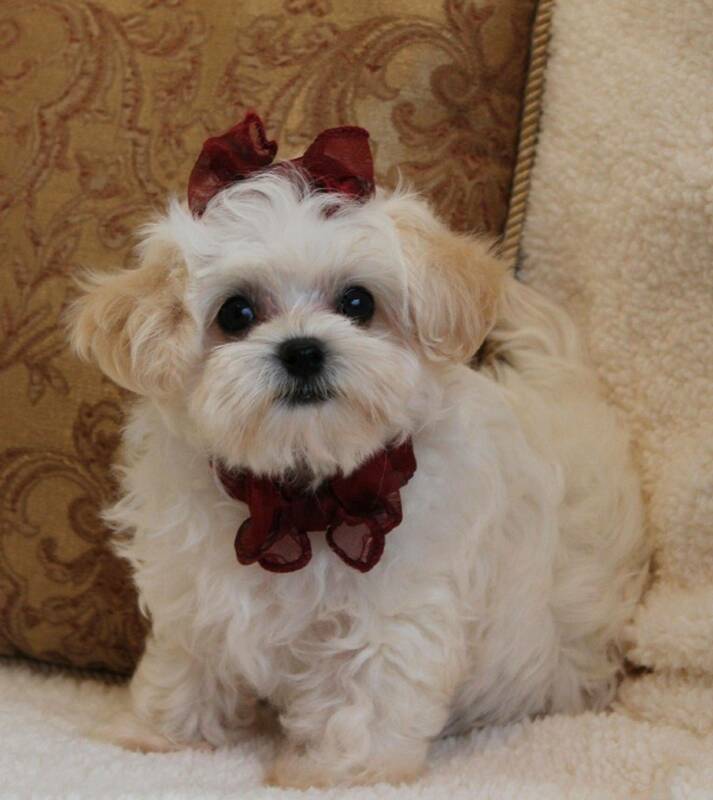 Show-Me Puppies wants to say congratulations to Shelia and family on making Kricket part of their family! Morkie Maddox Cutest Puppy Ever! I took these updated photos of Maddox yesterday 1/10/12. I is just the cutest puppy ever!! He also has such a sweet and cute personality. He is quite a little ham! :) Maddox will be going home to Mike soon! We have a new litter of 4 Bulldog Hybrid puppies. These puppies are 3/4 English Bulldog 1/4 Beagle. They make wonderful family pets. Chubs (Bully-BeaBully) the puppy in the photo below belongs to the Hutchison family. This is what they had to say about their Show-Me Puppy in a recent e-mail update, "Chubs is doing great! He loves his boys, goes everywhere they go and... he enjoys a good game of tug-a-war! Lol"
Morkie Puppies, More Available Soon! All of Tiny and Nick's baby Morkie's have been placed with their new families and are just waiting to get big enough to go home to their new families. We have 4 additinal little Morkie babies our girl Lucy and Nick. These Morkie babies will be 8 weeks old on 2/1/12. I will be taking and posting photos of them when they are 6-7 weeks old in mid to late January. These puppies are just as adorable as Tiny and Nick's babies. If you like the looks of Ranger, Dominick, Maddox and Sassy you will like these babies. Dominick is pictured below. On 12/28/11 Dana wrote, "Vernetta, Hope you all had a very Merry Christmas!! I have attached a couple of photos of Bandit. He is really growing! I have taught him to sit, to shake and he is house broke! He loves his new family! He is such a smart puppy and learns so quick, we just love him to death! Dana"